Immaculate four bedroom detached house for sale located in a small residential estate in the village of Newtwopothouse with primary school, creche, shop/post office and restaurant all located within walking distance of the property. 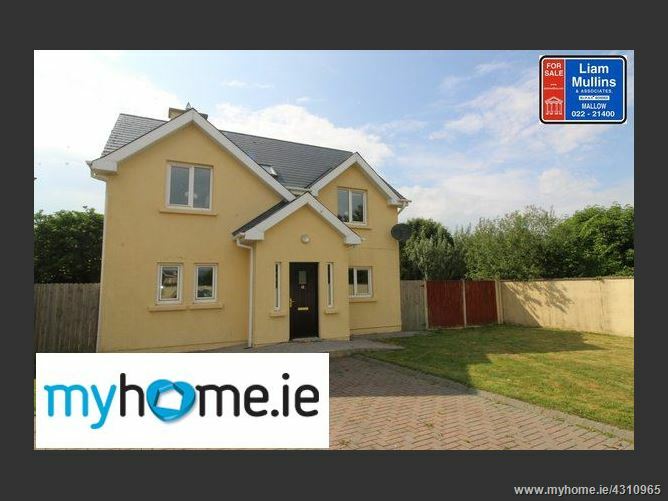 Centrally located on the N20-Cork Limerick road with Mallow, Doneraile, Ballyclough and Buttevant all located within a few minutes\' drive. Bedroom 4 12\'3 x 9\'5 3 Double Power Point and timber floor. -	Ensuite	6\'2 x 5\'9	Tiled floor to ceiling, electric shower. To arrange an appointment contact Liam Mullins on 022 21400 or 087 2441625 Viewing of this property comes highly recommended by selling agent, by appointment only. These particulars have been prepared with care, but their accuracy is not guaranteed they do not form part of any contract and are not to be used in any legal action. Intending Purchasers/Lessees must satisfy themselves or otherwise of any statements contained herein and no warranty is implied in respect of the property described. The particulars are issued on the understanding that all negotiations are conducted through the agency of Liam Mullins & Associates.